Question: I’m looking for some suggestions on houseplants to put in my kitchen. 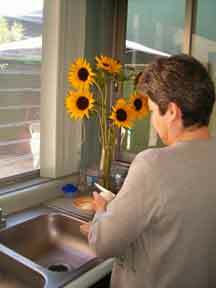 The kitchen window over the sink is large with bright but filtered light – never any direct sun. Answer: Both the Aglaonema and Spathiphyllum – that’s the peace lilly – do give you a lot of green. Even a peace lily not flowering is attractive! However, if they’re doing well that gives me some idea of the light in the kitchen. To add some color you have several indoor plant choices, actually many more but we’ll try to keep the maintenance low, color high and take into account the valuable kitchen real estate – the counter space! Pothos Plant: is a good place to start. It’s easy to grow, cuttings root easily, the vine can grow vigorously but a few snips with the scissors will keep it compact. Three Pothos varieties to look out for, Jade, Golden and Marble Queen. For color I’d go with the “golden” variety. Pothos are not expensive but take a little time looking for the right plant – one with bright yellow and green color. Your bright kitchen sounds like a perfect combo. Orchids: will offer many color options. Contrary to what people may think orchids are not any more difficult to care for than other plants. They love humidity which a kitchen should provide. I’d vote for the Phalaenopsis orchids. When buying an orchid the get the longest lasting flowers buy from the freshest and most recent shipment. It’s possible to get 3-4 months of color from phals. Again your kitchen sounds like a great match. Bromeliads: as far as long term color the Bromeliad is probably the best choice in the colorful houseplant department. Just like orchids the bromeliads give lots of color options. The more popular and longest lasting varieties will come from the Guzmania family, with colorful upright blooms. Again for the freshest longest lasting bromeliad flowers and color get the most recent shipment at the garden center. We will never share your email address period.